The hotel is a short distance from the beautiful Lumpini Park, Silom Road and the bustling Patpong Night Market, and close to shopping malls. With BTS Saladaeng and MRT Lumpini stations nearby guests have convenient access to all the city has to offer. Located in the heart of Southeast Asia, Bangkok is a modern and lively city with a variety of attractions to offer. The bustling city is filled with magnificent palaces, diverse cuisine from world-class restaurants to street stalls and shopping malls. The hotel is a short distance from the beautiful Lumpini Park, Silom Road and the bustling Patpong Night Market, and close to shopping malls. With BTS Silom and MRT Lumpini stations nearby guests have convenient access to all the city has to offer. The "It's all about TASTE TABLE" restaurant reinvents tapas. Try out new flavours by simply creating your meal among 20 typical local dishes. Enjoy your own flavour combination ! Everything was very nice and pleasent. The knowladgable and helpful front staffs were fantastic. They were very nice and were helping me sorting out my problems. Also thanks all the lovely housekeeping ladies who did my room daily for the whole 2 weeks. I would like to commend how fast the service is every time I request for something like pillows or iron. The room is always clean as well. I stay one night with breakfeast. Everything is great except the shuttle service which doesn't available on weekends. The hotel is in need of some new carpets and did feel a bit tired. But for the price was acceptable. Extremely satisfied with the hotel. Always happy to stay at Ibis Sathorn. Friendly staff, clean rooms and close to all the things that I require for a wonderful time in Bangkok. It is a good hotel to stay in for a short trip, the room is simple but enough for a short team stay. The only comment that I wish the management to improve is the sound insulation of the wall, I can hear a lot of talking coming from my adjacent room. I hope the sound proofing part might need to be step up. Breakfast is simple and enough. Everything is good. Rooms and beds are bit small. Very good breakfast. It's my 4th stay at IBIS Sathorn I believe that tells all. Great location, modern and clean lobby & room, good facilities, professional staff, great value for money. value for money. clean and neat. Great locatie and good value for money. Clean,comfortable room in a great locatie. Walking distance to metro, or complimentary hotel tuk- tuk to nearest sky train. In the immediate area of the hotel plenty of restaurants, bars, massage parlours and supermarkt across the road. Asked for two extra pillows at reception and it was sorted out immediatly. Only minus point was there could have been a better selection at the breakfast buffet. We enjoyed our stay and found it good value for money. 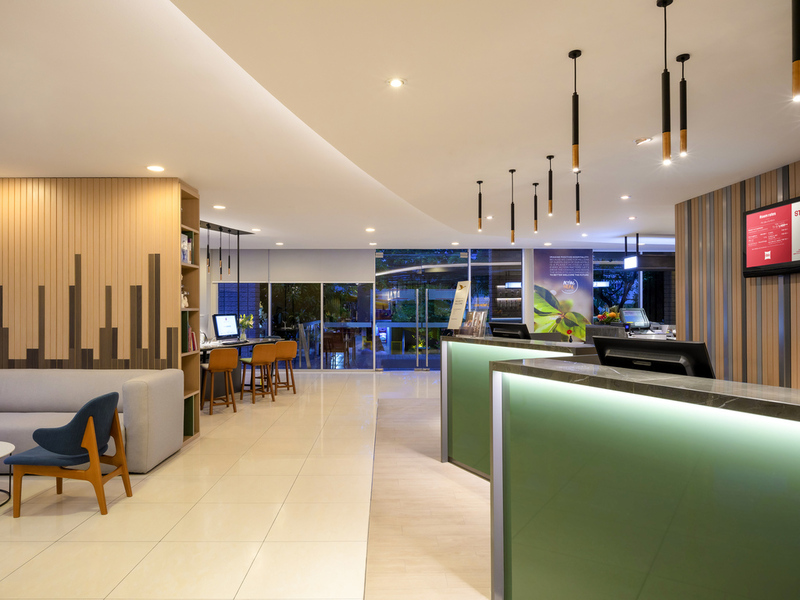 At this IBIS the service is friendly and attentive at the reception, restaurant, breakfast and house keeping. This is the most positive point! My only negative comment is, that the level of noise from corridors and other rooms is very high. Specially if the guest from the next rooms are noisy. Not a great hotel to walk around but near enough to Silom that you can catch motorbike there. Walking distance to MRT (underground metro) although hotel has the car to take you there but every time I asked it seems to be out of the operating hours and no car for weekend. But if you just want a cheap clean place to sleep with good need, this is it. Rooms are very good, very clean. Staffs are helpful.